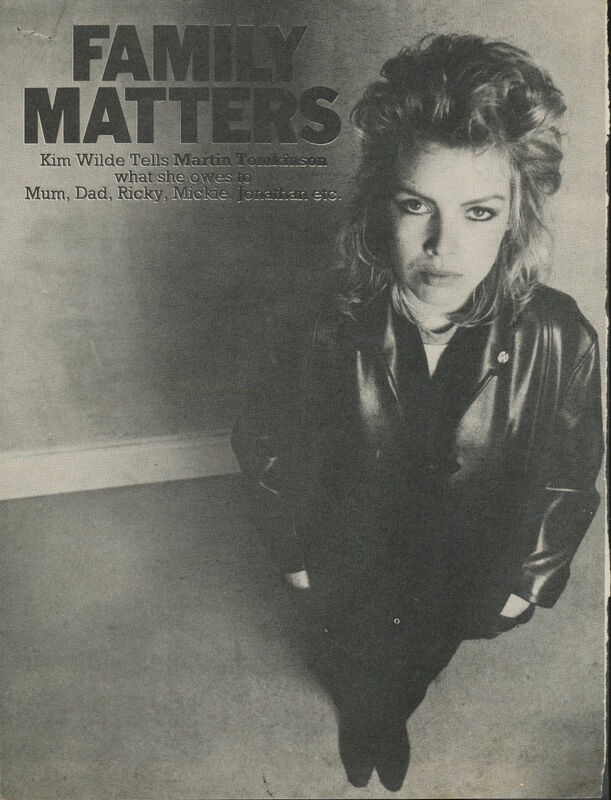 Kim Wilde tells Martin Tomkinson what she owes to Mum, Dad, Ricky, Mickie, Jonathan etc. Some are born to fame, some have fame thrust upon them and some are made famous by Mickie Most. Or so it would appear. The slickest, most professional operator in the pop business has created a string of stars, some of whom may stay around a long time and some of whom won't. What they all get is massive media coverage. 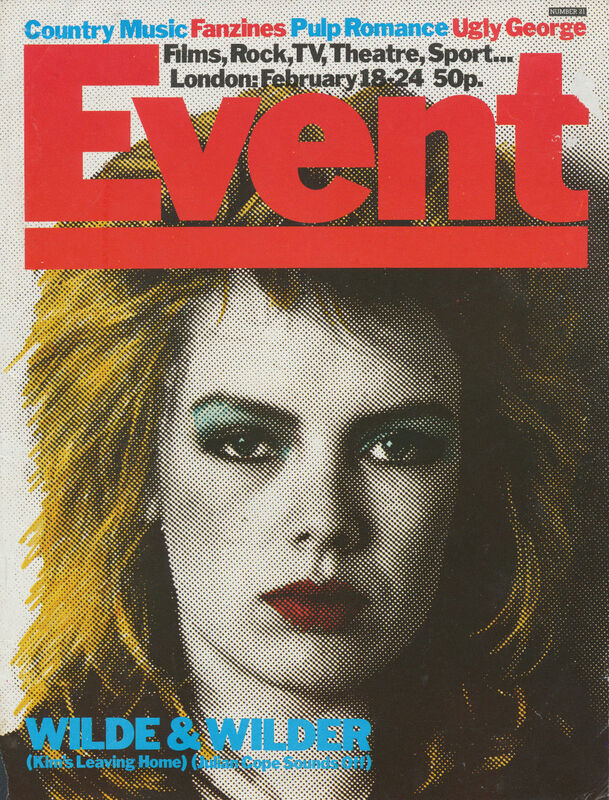 Most's latest prodigy, Kim Wilde, is no exception. Gifted with an exceptionally striking face, Kim Wilde is instantly recognisable, despite having only been in the record business for just over 12 months. To walk down the street or go to a pub with her is a perilous proposition. When I interviewed her recently an untidy gaggle of schoolchildren surrounded her in the street demanding autographs and asking her to sing one of your songs - you know, that one, Columbia (presumably meaning 'Cambodia'); three burly workmen somehow insinuated themselves into the group asking for specially personalised messages by way of autographs and the whole street stopped and stared. In the pub it was exactly the same story - embarrassed, almost bashful, men shuffling up and asking for Kim's autograph on beer mats, 'for the kids, you understand'. All of which Ms Wilde, who has been predictably dubbed the 'Bardot of pop' by such discerning newspapers as the Sun, takes very much in her stride. She says she quite enjoyed being recognised in the street and the constant asking for autographs has not yet turned sour. Of course, she has had one strong advantage in preparing her for the rigours of fame in the shape of her pop-star father, Marty. She has observed her father on the road and even sung backing vocals for him and brother Rick so she knows that the way to stardom is far from paved with instant gold. Perhaps because of watching her father, Kim does not play gigs. She hasn't got her own band and simply makes records in Mickie Most's palatial RAK studios in St. John's Wood. When we met, she and her PR man Bill Harry were fuming about a story that had appeared that week in the Sun claiming that Kim had just signed an American deal, worth £1,5 million. What annoyed them was that the story implied that Kim had already been paid this money whilst all that had happened was that she and Most had signed a record deal in Los Angeles. If she sells million upon million of reords, then the deal might be worth £1,5 million but at the moment the deal isn't worth anything. When I left them, Bill Harry, a greying curly-haired diminutive Liverpudlian was demanding a printed apology from Rupert Murdoch's favourite reading matter. I wished him luck. Kim's relationship with her parents seems almost too good to be true. At 21, she still lives at home, her father and brother write most of her songs and her mother Joyce advises her on her business affairs. Asked what her strongest musical memories as a child were, Kim replies slightly surprisingly 'Gene Pitney and Cilla Black - people like that'. She is clearly a child of pop and her songs are unadulterated pop. That is their attraction. Although 'Cambodia' contains some vague sort of social message, Kim is at best singing simple, straightforward pop songs. When I asked her why her first hit was called 'Kids in America' when she hadn't even been to the US she answered disarmingly enough 'Because it sounded like a good song'. She answers questions lucidly and cogently with an intelligence which quickly belies any ridiculous journalistic presumptions of being a 'dumb blonde'. No, she doesn't go to discos very much because it can lead to trouble. She prefers to go to a local pub in her area (Hertfordshire) or just go and see friends. At the moment she is flat-hunting because her parents now have two recent additions to their family and 'after all I am 21 now'. She says her mother is still very protective wanting to know where she is 24 hours a day, but she 'understands that'. She could not think of ever moving from London because 'London is the best place in the world'. She speaks politely about Los Angeles but clearly was not very happy in America. Her Cockney accentis marked without appearing exaggerated and her trip to America has happily left her free of the dreadful 'mid-Atlantic' drawl affected by so many pop stars. Just now, Kim is busy on a video for the Japanese market selling a bitter lemon drink for Toshiba. The firm had sent no fewer than 15 people over to make the video and the RAK studios seemed slightly incongruous for the neatly suited, bowing and politely smiling Japanese. But Kim says she gets on well with them. 'They're really funny, they appreciate our sense of humour and if we tell a joke they laugh about 30 seconds after we do.' She is very excited about the commercial because she sees it as a way of breaking into the lucrative Japanese market. The profanity sounded almost shocking. It's not that Kim Wilde seems too 'neece' to swear. Just that this was the only occion thoughout the interview that she did swear and I wondered for a moment whther the veil had momentarily slipped. Because clearly Kim has been well groomed. She happily put up with an hour long photograhic session in a cold cellar at RAK's studios, easily tolerating the endless shots demanded by the photographer. She doesn't appear to get either angry or fazed by what must be monotonously similar journalists's questions. If she resents any of this then she does not show it. Similarly there was no attempt on her PR man's part to over-hype Kim. Bill Harry is a suitably relaxed man who, having spent umpteen years as a pop muic journalist, now writes biographies of pop groups wilst doubling as a freelance publicity man. Contrary to my jaundiced view of public relations men he did not hover nervously over his charge and seemed refreshingly uninterested in whether Kim committde a gross indiscretion or not. As for the music, well that's according to your taste. It's hardly likely to be still around in 20 years time but then very little popular music lasts that long anyhow. 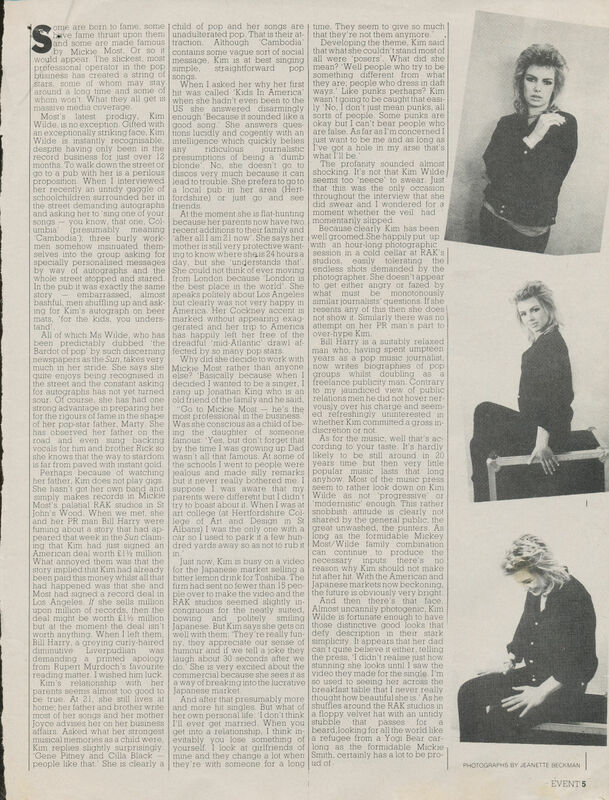 Most of the music press seem to rather look down on Kim Wilde as not 'progressive' o 'modernistic' enough. This rather snobbish attitude is clearly not shared by the general public, the great unwashed, the punters. As long as the formidable Mickey Most/Wilde family combination can continue to produce the necessary inputs there's no reason why Kim should not make hit after hit. With the American and Japanese marktes now beckoning, the future is obviously very bright. And then there's that face. Almost uncannily photogenic, Kim Wilde is fortunate enough to have those distinctive good looks that defy description in their stark simplicity. It appears that her dad can't quite believe it either, telling the press 'I didn't realise just how stunning she looks until I saw the video they made for the single. I'm so used to seeing her across the breakfast table that I never really thought how beautiful she is'. As he shuffles around the RAK studios in a floppy velvet hat with an untidy stubble that passes for a beard, looking for all the world like a refugee from a Yogi Bear cartoon, Reginald Smith certainly has a lot to be proud of.